It’s easy to launch apps on your iPad or iPhone, but once you’ve downloaded dozens, finding the app you want can prove a challenge. Here are some tips to help you cut through the clutter and make your iOS device easier to use. 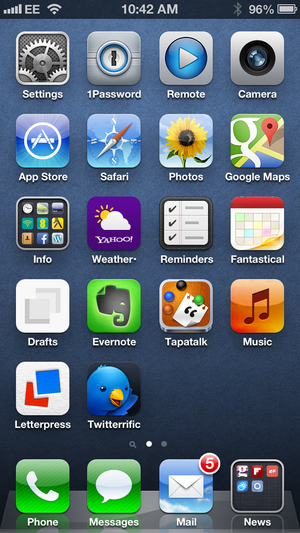 To get quick access to your favorite apps, move the ones you use most into your iOS device’s Dock. To do this, tap and hold your finger on an icon until all your apps’ icons wiggle. Pick an app in the Dock that you don’t use routinely and drag it off. Then, drag the one you want onto the Dock in its place. Your favored app now will be easier to tap one-handed. (If you have an iPhone, your thumb can get to the bottom of the screen more easily than the top.) And, the app will be available from any home screen. If you have lots of apps, it can help to group them by type or function in folders. If you have a lot of apps, you can sort them onto different home screens. To add a home screen, tap and hold your finger on an icon until all your apps’ icons wiggle. Then, drag any icon to the right of the screen. Wait a second until your iOS device swipes the home screen to the side and displays a new, empty one and then drop the app there. You can now swipe back to the previous home screen and drag more apps, if you wish. You can see how many home screens you have (and which one you’re on) by looking at the tiny line of dots that appears above the Dock and below the home screen’s icons. Another way to group apps is by creating folders. Tap and hold on an icon until all the icons wiggle, and then drag one app onto another. Then, wait a second. Your iOS device will create a folder, and will give it a name based on its contents—for example “Business” or “Arcade.” If you prefer to name it yourself, tap next to the name and type in a new one. Then, tap outside the folder’s contents, or press the home button, to close the folder. To launch an app in that folder, tap the folder, and then tap the app’s icon. 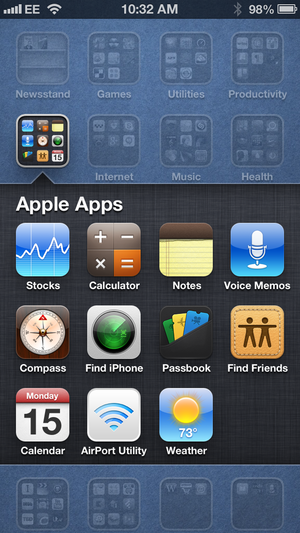 Put a folder of apps in your iOS device's Dock so you can access more apps from any home screen. You’ve seen how to use the Dock, and you’ve seen how to set up folders. Well, you can also put a folder in the Dock. Instead of only having four apps accessible from your iPhone’s home screen, you could have three apps and a folder, or up to four folders. Once you’ve moved a folder into the Dock, tap to open it, and then tap an app to launch it. While you can do everything I’ve described on your iOS device, sometimes it’s easier to get organized in iTunes. Connect your iOS device to your Mac. Then, in iTunes, click the Devices list to find your device, and then click the Apps tab. You’ll see your main home screen, and all your apps, along with other home screens you’ve set up. You can drag any app to any home screen, create folders, delete apps and more. When you’re finished, click Sync so iTunes sends the new setup to your iOS device. 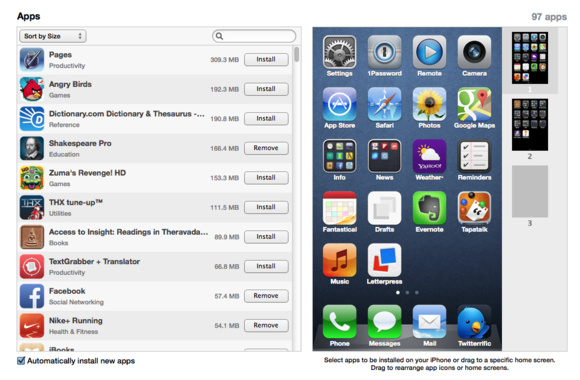 You may find it easier to rearrange your apps within iTunes. You don't need to remember which folder an app is in with Spotlight; just type a few letters of its name to make it appear. If you have lots of apps, tapping folders and swiping through multiple home screens might be a lot of work. There’s another way you can do this: Just swipe to the right from the first home screen to bring up the Spotlight search field. Type a few letters of the app you want to launch, and, when you see it in the results list, tap it to launch it. If you don’t like typing, you can save some time by dictating to Spotlight. When the Spotlight search field is visible, tap the microphone icon on the keyboard, next to the spacebar. Say the name of the app you want to use and then tap Done. (Note that you probably won’t see the name you’ve dictated until after you tap Done.) Tap your app in the search results list. 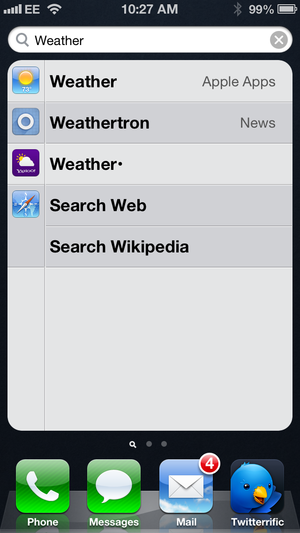 Using Siri to open apps can be faster than using the Spotlight search field. Press and hold the home button until the Siri screen displays. Say “Launch app name,” or “Open app name.” Siri will open the app, or, if there are more than one that contains the word you said, it will show a list of apps that match. Tap one to launch it. To see which apps are running, double-press the home button. You’ll see a row of icons at the bottom of your screen; these are apps that are currently active. Swipe to the right to see more apps, and tap the one you want to switch to when you find it.